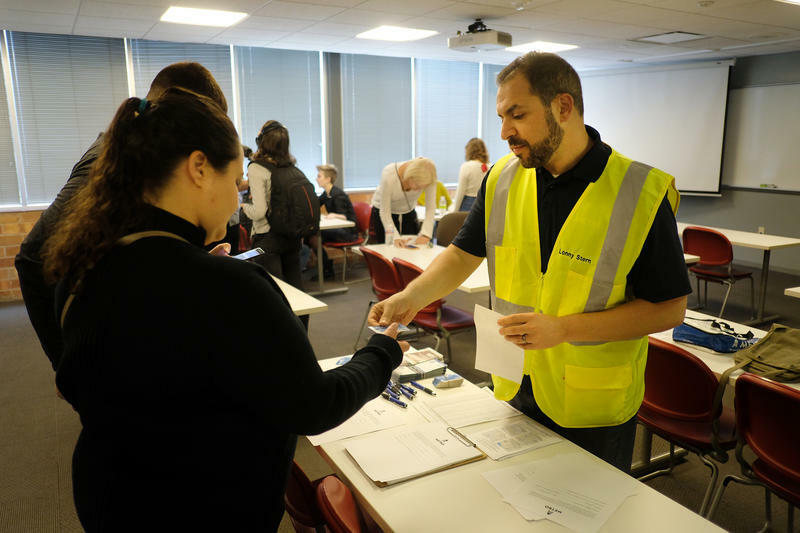 Lonny Stern, a special projects coordinator with CapMetro, hands out material about taking the bus. Priscilla Jove, 19, sat cross-legged on a bench at a bus stop on the corner of West Oltorf Street and South Lamar Boulevard. A student at Austin Community College, Jove was heading to a biology study session. She said she’s not just curious about the human body, but also human behavior, and that's one reason she rides the bus. But there’s another reason Jove takes public transit. “Owning a car is too expensive,” she said. As Jove boarded the 338 bus headed north, a small crowd began to gather at the stop for a “transit adventure.” Employees from Capital Metro and the city ride the bus with residents to try to show how simple ditching a car can be. It’s all part of a new program called Smart Trips Austin, which seeks to encourage residents to consider alternative methods of getting around. Austin City Council members voted in April to spend up to $1.5 million over five years for Smart Trips. (That contribution is split equally between CapMetro and the City. )* The program focuses resources – including staff-led biking and transit "adventures" and free bike and walking equipment, such as a B-cycle day passes or water bottles – on a specific region of the city’s closer-in neighborhoods. “If you are invested in your neighborhood and you realize … that you’re a block or two walk over to transit or to a good bikeway and that it’s going to be close to your work, as well, then you’re really motivated to try it for that purpose,” said Lonny Stern, a special projects coordinator with CapMetro. Jove is not the kind of person CapMetro and the city are concerned about with programs like Smart Trips, however. According to Stern, the program focuses on neighborhoods closer to downtown where there is already greater bike, pedestrian and transit infrastructure. These neighborhoods also tend to be wealthier. The program is currently centered on South Central Austin, a collection of neighborhoods that includes Bouldin Creek and Zilker. In 2015, median household income of the area was $69,473, more than $10,000 greater than all of Austin. Forty-eight percent of households owned a car, compared to 41 percent across the city. A 2016 pilot of the Smart Trips program focused on neighborhoods in North Central Austin – regions including Hyde Park and Brentwood. That area had a 2015 median household income of $56,830, closer to the city’s overall median. Staff do pre- and post-program surveys to calculate the effect, if any, the program has had on local travel behavior. In the 2016 program, respondents increased their transit use on any given day by 5.9 percent. Stern said when there are good public transit options, residents can be convinced to make a choice between car and bus. “A lot of times the places that have the most infrastructure, we’re catering to people who are the wealthiest households … I recognize that,” Stern said. “But at the same time, you don’t want to set people up for failure. So, if you’re going to show people it’s quick and easy or you can add this into your week, you want to make sure that the infrastructure is there to support them." But is educating people about their options enough? 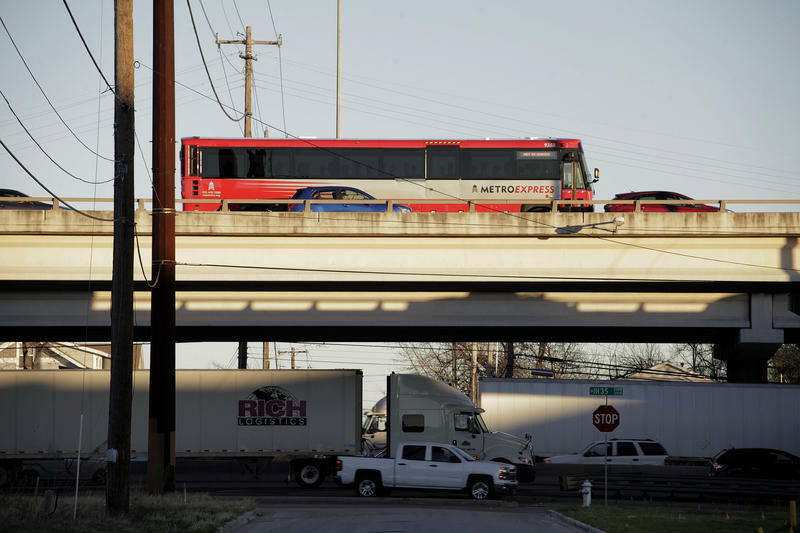 Michael Walk, a researcher with the Texas Transportation Institute, said transit has to be more convenient than driving for people to make the switch. Saturday’s "transit adventure" included stops at major parts of the East Austin Studio Tour – by bus, of course. But of the six people who came along for the ride, only two were not employed by CapMetro, the city or a Smart Trips consultant. A young couple drove in from San Marcos because, they said, they wanted to see the art. “It looked like fun and we like art,” said Claudia Perez, who came along with her boyfriend, Fernando Menendez. And although they didn’t come to necessarily ride transit, they shared their thoughts on what it would take for them – if they lived in Austin – to ditch their cars. *Correction: An earlier version of this story misstated the total cost of the program and the contributions from each agency. The bus stop at the southeast corner of 12th Street and Chicon once featured vibrant plaques commemorating the history of East Austin. But the plaques have fallen into disrepair since being installed in 2003. Now, Capital Metro wants to redo the bus stop to honor the area's African-American legacy.